Not sure what they are planning but I can't think of another fitting way to memorialize Paul then a gathering at the Clink this Sunday with players, coaches and popular Seattle figures speaking about what he has meant to all of us. Afterwards a replay of XLVIII in the stadium that ends with the part where Paul hoists the Lombardi. They need to make a Paul Allen statue next to the 12th man flag or maybe incorporate in a way holding the rope. So everytime its raise Mr. Allen can be part of it. I would like there to be a statue of Mr. Allen our in front of the stadium. I would like to see him have his hand out awaiting a hand shake. I never had the pleasure of meeting him or even thanking him for what he did for the Seahawks and the world. With a statue like this, I can walk up and shake the hand of a great man and tell him thank you. 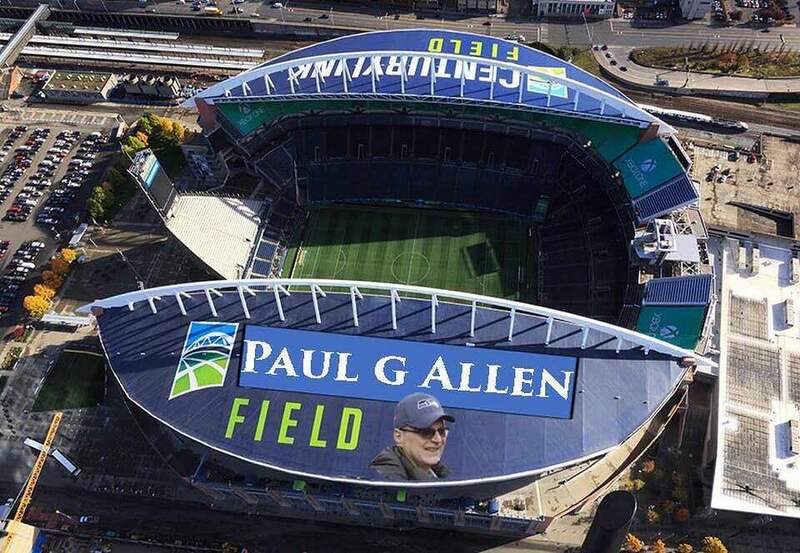 Need to change the Soho district to Allen Town, Need him in the Ring, need a Statue at the Entrance and nest to the Flag, then name the Stadium Paul Allen Stadium, he is no less influential as Paul Brown was concerning Football much more concerning Seattle and the world. Put a PA stencil on all the equipment at least for a season. Frankly, if Paul chose a memorial, I bet it would be understated, sublime, and behind the scene. Kinda like he lived. BubbaGump wrote: I would like there to be a statue of Mr. Allen our in front of the stadium. I would like to see him have his hand out awaiting a hand shake. I never had the pleasure of meeting him or even thanking him for what he did for the Seahawks and the world. With a statue like this, I can walk up and shake the hand of a great man and tell him thank you. This is a very unique idea. I would support this one. IMO if he had his choice ; he would want the Hawks to make the playoffs and " GO DEEP "
That was my first thought as well but since Century Link has payed a lot of money to get their name on there, I doubt they'd want to be displaced. However when the contract is up change the name to Allen Stadium and sell rights to the turf, or the grounds etc..
Last edited by TreeRon on Wed Oct 17, 2018 6:37 am, edited 1 time in total. That was my first thought as well but since Century Link has payed a lot of money to get their name on there, I doubt they'd want to be displaced. However when the contract is up change the name to Allen Stadium, then and sell rights to the turf, or the grounds etc..
We have Pokey Allen Field at Albertsons Stadium. I prefer something that will stick and stay. Outside will change hands as a different financial group takes up the outside mantle, inside should never change...at least the field. So make it Paul Allen Field. A lasting legacy. True, by then it will be Paul who? We need to add him into the ring of honor, right next to our championship banner . I think he would like that. Absolutely love this idea! And there are a lot of good ones in here. Keep 'em coming! I like the idea of a statue next to the case where Holmgren gave the game ball to the fans. next home game, have Bill Gates raise the 12th man flag to half staff. DynoHawk wrote: next home game, have Bill Gates raise the 12th man flag to half staff. Or his family/widow. I'm sure they're grieving right now and after that hatchet job that council woman did on his legacy; I'm sure a stadium full of appreciative fans would be a balm to their injury. I like the idea of a statue of him outside, life-sized, and not on a pedestal -- just like a normal guy on the street. People could take their pictures with him, dress him up on holidays, w/e. That seems to be the kind of guy he would have liked to have been if everyone didn't know he was so filthy rich. Somewhere, in an existence we do not understand, yet, Tuba Man is playing for Paul.